Recycle your waste and save both the planet and money. 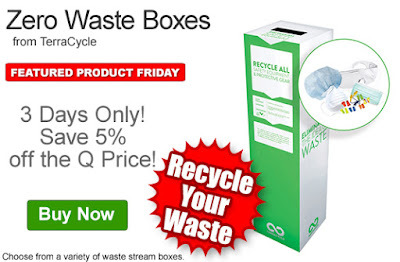 Get 5% off the Q Source Price of TerraCycle Zero Waste Boxes. Our FPF072916 Coupon Code is auto applied when you add an eligible Zero Waste Box to your shopping cart. This Featured Product Friday (FPF) promo is valid from today, July 29, 2016 through Sunday, July 31, 2016 and the code is unlimited use. TerraCycle’s Zero Waste Boxes are available in a variety of material/environment styles that provide a solution for difficult to recycle waste items. Zero Waste Boxes are available for disposable gloves, safety equipment & protective gear, protective eyewear, beard nets/hairnets/earplugs, pens/pencils/markers, mailing/shipping/packaging materials, and more. For further questions about Featured Product Friday, please read our informational blog post, call us (800-966-6020), or send us an email. Please note: This promo is valid only at QSource.com and expires on July 31, 2016. Wow! Talk about savings! This limited-time (ends 7/29/16) promotion saves you $8,549.93 on the SCS 711 Charge Analyzer. All you have to do is buy 10 of the same eligible SCS ionizer model and you’ll pay just a penny for the 711 unit. When you buy ten of one of the aforementioned SCS ionizers, you get the SCS 711 Charge Analyzer/Charge Plate Monitor for only a penny. The SCS 711 (a $8,549.94 value) allows for testing the performance of products used for static control and elimination by measuring static field, ionization performance, charge retention/drainage, and charge generation/drainage. To get your SCS 711 Charge Analyzer for a penny, please add ten of an eligible SCS ionizer to your shopping cart. The SCS 711 will be added automatically at the penny price. Visit the promo page at QSource.com today to take advantage of this amazing money-saving deal…remember, it expires July 29th, 2016. You may also contact us via our Web site, phone (800-966-6020), or by email. In Steve’s latest Guest Blog for the Q Source Resource, he recommends a process of PCB preparation for rework/repair. Preparing PCBs (printed circuit boards) for rework or repair is a very important process. ACL Staticide has developed and manufactures an array of precision cleaners and surface preparation products, along with final finishing conformal coats to aid in this application. These products’ primary focus is in the area of printed circuit board repair and OEM manufacture. Let’s cover some key areas of PCB rework and repair using a two-step process for surface preparation and finishing. In many instances of PCB repair, surface preparation with a pre-saturated wiper followed by treatment with conformal coating is the process of choice for reworking a board and getting it back into service. With that in mind, ACL’s 7600 IPA Wipers are perfect for surface preparation following repair. The 7600 is a pre-saturated wipe using a precise 70/30 blend of extremely pure, electronics-grade isopropyl alcohol blended with deionized water to prevent premature evaporation of the cleaning solvent. The solvent is added to the wiper in a cleanroom environment. These wipers use a non-woven Sontara® technology designed to be extremely low linting, even at the perforation. Available in a 100-wipes reclosable container (made of non-hazardous material), the 7600 product is perfect for final finishing work of any circuit board. It is great for removal of hand oils, conductive greases, carbonized soils, dust/dirt, light flux residues, and a variety of other soils. A 2-wiper use process is recommended for general-purposed cleaning and hand wiping of larger components and various board surfaces. One wipe is used for initial cleaning of heavier residues, and a second wipe for final surface cleaning and finishing. All surfaces should be allowed to gently dry for one to two minutes, or dry using compressed air or a duster product like the ACL 8640 Turbo Blast Duster. Following this process, the board is prepared and ready for application of surface protection like acrylic conformal coating. ACL’s 8690 Acrylic Conformal Coating is the product of choice for protecting the PCB and all surface components from oils, moisture, and most soils. It is used following surface cleaning and preparation with the 7600 IPA wipers. ACL 8690 can be applied to the entire board surface. It is dry to the touch in less than 30 minutes and completely cures in 24 hours. It provides protection as well as heat resistance and contains a UV dye indicator so that the user can be sure the entire board and all components have been treated. ACL 8690 leaves behind a high-gloss cure (making it suitable for final presentation to the customer at contract manufacturers) and prepares the board for final installation. This process of using both the 7600 wipes and 8690 conformal coating in conjunction with each other for final board preparation and final surface finishing prior to installation helps eliminate potential failures and damage to PCBS or devices. Please contact us with related questions or comments. Thank you, Steve! That sounds like the way to go when preparing printed circuit boards. We look forward to your future articles. For information about , or to order, any of the ACL products mentioned in this blog, please visit QSource.com. You may also contact us via email or phone at 800-966-6020 and we will be happy to assist you. 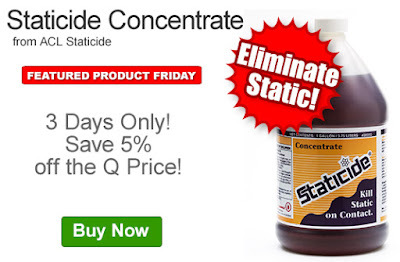 Save 5% off the Q Source Price of ACL Staticide Concentrates. Our FPF072216 Coupon Code is auto applied when you add an eligible concentrates to your shopping cart. This Featured Product Friday (FPF) promo is valid from today, July 22, 2016 through Sunday, July 24, 2016 and the code is unlimited use. ACL’s concentrates help eliminate static control problems in an inexpensive and easy way. Safe to use, these biodegradable solutions provide long-term static control. For further questions about Featured Product Friday, please read our informational blog post, call us (800-966-6020), or send us an email. Please note: This promo is valid only at QSource.com and expires on July 24, 2016. "The Social Rewind," is a weekly compilation of what we thought were the most interesting, funny, or informational social media posts of the previous week. Q Source follows a variety of really fascinating companies and individuals on Twitter, Facebook & Google+ and we want to share the best of what they have to say. Leading off this week’s column: Are you a snack-a-holic? That doesn’t have to be a bad thing. GelPro’s post looks at 20 snacks that help you burn fat. IDEAL Electrical doesn’t want you to take electricians for granted. Check out their reasoning with this post about why you need an electrician in your life. Are more antibiotic-resistant superbugs coming? Puritan’s post warns that there are. And we close out this week’s column with our post about July’s Q Source Resource Digest email. 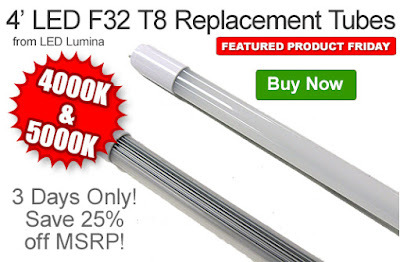 Save 25% off the MSRP of LED Lumina’s 4’ LED F32 T8 Replacement Tubes (1950 Lumens, 18 W, Frosted, 4000K & 5000K). Our FPF071516 Coupon Code is auto applied when you add an eligible replacement tube to your shopping cart. This Featured Product Friday (FPF) promo is valid from today, July 15, 2016 through Sunday, July 17, 2016 and the code is unlimited use. These TL-4-18 replacement tubes uses less power than standard T8 tubes and fit all fixtures that use 4’ fluorescent tubes. For further questions about Featured Product Friday, please read our informational blog post, call us (800-966-6020), or send us an email. Please note: This promo is valid only at QSource.com and expires on July 17, 2016. Luxor’s carts are used in work-intensive environments for a number of applications. Now through July 31, 2016, you can save an extra 10% on select carts at QSource.com. 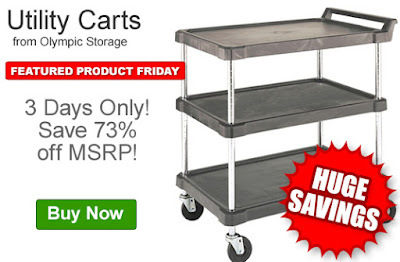 To place an order and save an extra 10% on these versatile Luxor carts, please visit our QSource.com promo page today. You may also contact us via our Web site, phone (800-966-6020), or by email. 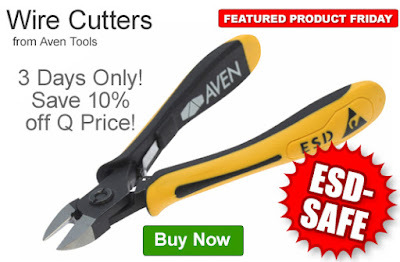 Save 10% off the Q Source price of Aven Tools Accu-Cut Wire Cutters. Our FPF070816 Coupon Code is auto applied when you add an eligible wire cutter to your shopping cart. This Featured Product Friday (FPF) promo is valid from today, July 08, 2016 through Sunday, July 10, 2016 and the code is unlimited use. Aven Accu-Cut Cutters are ergonomically designed with ESD-safe grips, superior cutting-edge technology, and extremely durable edges. They are perfect for cutting through heavy-duty wire and a variety of other applications. For further questions about Featured Product Friday, please read our informational blog post, call us (800-966-6020), or send us an email. Please note: This promo is valid only at QSource.com and expires on July 10, 2016. Leading off this week’s column: Do your eyes hurt? Do you have trouble sleeping at night? This post from Agilent Technologies says it may be too much LED screen time. Net zero buildings? 3M’s post looks at sustainable architecture and harnessing energy for good use. We’ve seen how 3D printers are being used in space. 3D Printing Industry’s post talks about the potential for moon rocks to be used in 3D-printed tools for a human trip to Mars. This may be a day late, but this Laughing Squid post examining how 4th of July sparklers work is totally cool to watch. Powerful AI is coming. This SemiWiki post posits that the self-learning artificial intelligence we’ve heard about for years is finally here. And we close out this week’s column with our blog post about Sovella’s new workstation configurator. 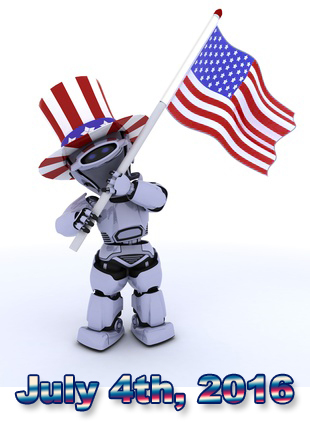 In celebration of Independence Day (the holiday, not the movie…heh, heh), Q Source will be closed on Monday, July 4th, 2016. We will re-open on Tuesday, July 5th for regular business hours. All of us here at Q Source would like to wish you a Happy 4th of July holiday and we thank you for your continued support and patronage. For your shopping convenience, QSource.com is open for business 24/7. Your order, placed via our Web site on the 4th, will be processed as soon as possible on Tuesday, July 5th, 2016. Please contact us with your related questions at qsales@qsource.com or via phone at 800-966-6020. Please subscribe to our email newsletter for additional Q Source product information, reviews, how-to articles, and special offers. Save 73% off the MSRP of Olympic Storage Utility Carts. Our FPF070116 Coupon Code is auto applied when you add an eligible utility cart to your shopping cart. This Featured Product Friday (FPF) promo is valid from today, July 01, 2016 through Sunday, July 03, 2016 and the code is unlimited use. These Olympic carts have a smooth, easy-to-clean surface, is NSF listed, and four 4”-diameter resilient rubber swivel stem casters. They also feature a ship’s edge to contain spills and offer tool-free assembly. For further questions about Featured Product Friday, please read our informational blog post, call us (800-966-6020), or send us an email. Please note: This promo is valid only at http://www.QSource.com and expires on July 03, 2016.